hd00:13MADRID - MARCH 10: Traffic on street Calle de Alcal near Metropolis building on 10 March 2012 in Madrid, Spain. 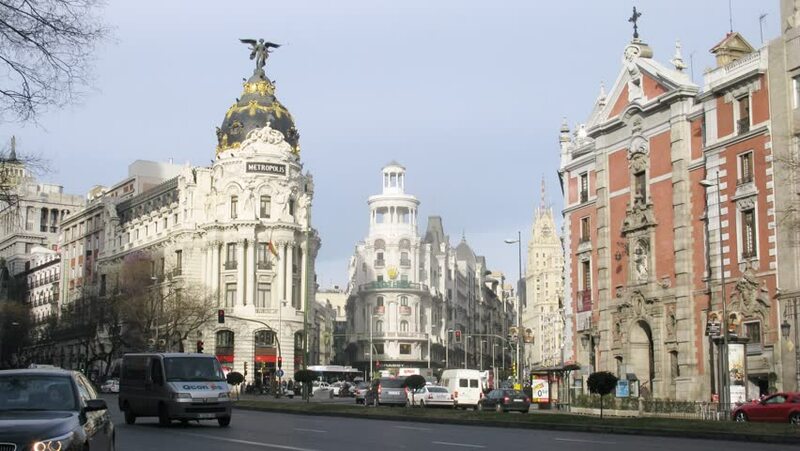 In 2012 number of tourists in resorts of Spain increased 1.5 times compared to 2011.
hd00:13MADRID - MARCH 10: Traffic on street Calle de Alcala near Metropolis building on 10 March 2012 in Madrid, Spain. In 2012 number of tourists in resorts of Spain increased 1.5 times compared to 2011. 4k00:15Prague, Czech Republic - December 24, 2016: View of Municipal House at the Republic Square in Prague. The Old Town is famous destination in Prague. hd00:16ZARAGOZA, SPAIN, NOVEMBER 1, 2014: People on Plaza del Pilar square in Zaragoza, in front of Basilica de Nuestra Senora del Pilar. hd00:20PRAGUE, CZECH REPUBLIC - SEPTEMBER 2016: 360 degrees rotation panoramic timelapse cityscape of the Old Town square with Tyn Church in Czech Republic Capital - Prague, Europe.